In 1970, the members of SEEMS wanted to select a name for our student award. They wanted to give the award a name that would be significant to both physical and biological electron microscopists. 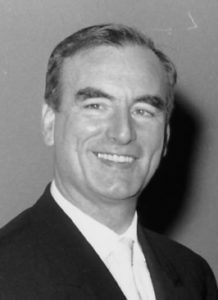 Dr. Roth suggested that they name the award the Ernst Ruska Award; he was asked to write to Ernst Ruska to get his permission to name the award after him. Mr. Ruska wrote back, in German of course. Since Dr. Roth’s German vocabulary is limited to “gesundheit”, he asked a friend to translate the letter for him. In Mr. Ruska’s letter, he suggested that the society name the award after him and his brother, Helmut, who was a biologist. Dr. Roth wrote back and thanked the Ruska brothers for permitting the society to use their name. When the time came to actually name the award, it was decided to name it the Ruska AWARD rather than the Ruska Brothers or the Ernst and Helmut Ruska Award due to the fact that the latter two or too cumbersome. They had planned to make the first award at our December meeting in 1971 which was scheduled to be held at Georgia Tech. That meeting was canceled due to a “heavy snow” that greatly limited the attendance at that meeting. Thus the first Ruska Award was made to Danny Akin in 1972. After making the first award, the society sent each of the Ruska brothers a plaque similar to the ones awarded to the students. 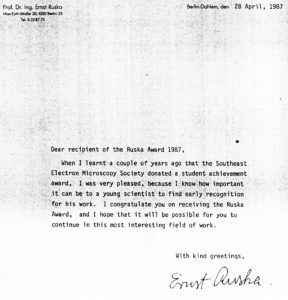 Everyone says how slow in progress the South is; however, it should be noted that our SEEMS Society gave the first Ruska Award in Ernst’s honor 17 years before EMSA recognized him and 18 years before the Nobel Prize Committee recognized him. So much for the South being behind the times.